I didn’t know Hannah had down syndrome until she was born. I had zero complications during pregnancy and the only thing that was mentioned ‘abnormal’ during my check-ups was that I was “measuring small’. What’s astounding to me is that very same doctor who said I was measuring small, offered me the number to the abortion clinic!! I lived in Maui, HI at the time and decided I wanted nothing to do with that hospital and came back to TN to have my daughter here around family. I loved feeling my sweet girl kicking around in her darkened, damp, and tiny world. My [ex] husband would make up songs to sing to Hannah while she was still in my tummy. He would tell her that she was “Daddy’s Girl” and that he was going to teach her how to throw a football and that he would take her to all the Daddy/Daughter dances and how he would turn her into a tom boy. She had him wrapped around her little finger before ever even seeing her…that is, until he did see her. He saw her simian crease in her tiny hand and suddenly unraveled himself from around that tiny finger. Everything changed. My labor was actually amazing. I gave an all natural birth and she was out on the 4th push. Excruciatingly painful, but amazing all the same. At 2:10 amin the morning in April 2014, they laid my beautiful Hannah Grace on my chest and God taught me in a millisecond what unconditional love was. I KNEW she had down syndrome the moment she looked at me with those almond shaped eyes, and it somehow made me love her even more. I knew it before any test were ran or confirmed, and so did my [then] husband. One of the nurses scolded me for not getting a ‘DS’ test as if I had just inconvenienced her with the life of my new baby. What a horrible way to treat a new mother and father instead of offering a ‘congratualtions’. Not exactly the welcome wagon you’d image. Unfortunately, Hannah’s father chose not to accept her diagnosis. He said that people would “feel sorry for us” and looked for multiple places to put the ‘blame’. He called her names no daddy should ever call their child. He said she was “defective” and that he was just going to go out and “get another one”, as if he could exchange her for a more ‘perfect’ child who was more ‘socially acceptable’. There was no more singing to her, no more joy in talking about her future, and after day five…there was no more Daddy at all. He left us. Hannah was diagnosed with 3 holes in her heart and possible leukemia shortly after birth and here I was left to do this on my own with no home to bring my baby to, no car, no husband, and very little money. My life had just been shattered. We lived in a hotel for a couple of weeks, and couch surfed with friends and family for 8 months. I was on a government food program that gave me vouchers for certain foods that we were ‘allowed’ to eat. Our world looked hopeless. Everyday I would hide my tears from Hannah just praying that Jesus would heal her heart and that I’d be able to provide a life for my baby…I just wanted her to live and feel loved and wanted. Developmentally she is doing incredible. She’s reached all of her milestones BEFORE the doctors and medical journals said she would. We celebrate every accomplishment, and all 3 holes in her heart closed before the was 2 years old. Praise God! It wasn’t until 8 months later I would find a job. And the stories that flooded those 8 months is enough to fill a book in itself but for the sake of time, we will fast forward to Jan. of 2015 when I was hired. 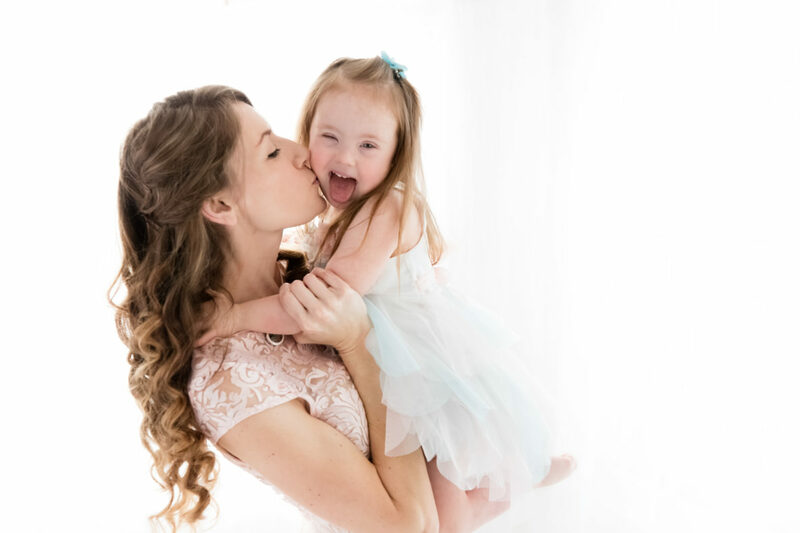 What Are Some Good Surprised You Were Not Expecting About Raising a Child with Down Syndrome? My employer just happened to be a pro videographer. I had prayed for a platform to un-teach the negative connotations that society has on children with down syndrome. And apparently God had a plan all along that He was preparing me for. My employer had seen some images I had taken of Hannah with my iPhone and told me that I had “a gift”, and that I needed to buy a “real camera”. I laughed in disbelief I suppose because the brokenness of recent months had completely killed any confidence that I would be able to do anything that amazing. But he kept on and so I saved money and bought one. I taught myself to use it and prayed and prayed and one late night and 2 pots of coffee later, Paperdolls Photography was born and God had answered my prayer for that platform. I wanted to show the beauty in those that the world view as ‘the least of these’. I didn’t want what happened to my daughter and I to happen to others. A few days after posting my first Collection online, media from all over the globe was contacting me wanting to know why I photographed children with special needs, so I happily obliged them and told our story. The images of my beautiful subjects continue to be published on an International scale showing the world faces that are defying the odds. Faces that the world once looked at and said, ‘you can’t, you won’t, you’re not worth it’, but my God said “Before I formed thee in the belly I knew thee…”. My daughter was no mistake. God did not say ‘oops, how did that extra chromosome get there?’ No, He said ‘you are fearfully and wonderfully made’. She was made on purpose for a purpose and proves the nay-sayers wrong on a daily basis. Every day is a new surprise with Hannah. She is like unwrapping a new gift every single day. But probably the biggest surprise was how sassy she is because you always hear that people with down syndrome are always happy, HAHA! Boy did she prove that theory wrong! She has feelings and emotions just like any other child and will let you know if she’s upset. She is happy for the most part, but she has has her moments just like any other kid would. Hannah loves all things music. She loves to dance and to be the center of attention when doing so haha! She also loves playing with her doll house, playing outside, and loves water. The main challenge I’ve faced is getting others to see the worth of my daughter despite her differences and taking the time to get to know her before making assumptions based on a diagnosis. Hannah’s differences are what make her so unique and beautiful, and those who take the time to see that will be touched by her amazing heart and will never be the same again. I never knew my daughter would be my greatest teacher. Sure there are challenges that come with raising her such as her speech delay, however that only serves to teach me to listen with my heart instead of my ears and to really pay attention and be present in the moment. She will do things in her own time just as anyone else does. In my eyes, she’s not behind. Who set the standards for ‘being behind’ anyways? Life isn’t a race, its a blessing that most take for granted. And you know something amazing, she was absolutely right. Praise be to Jesus for His wonderful love. Congratulations, you have so much joy and love in your future! That tiny chromosome will be one of the biggest blessings of your lives. Yes there may be some challenges, but there are are challenges with any child. Just love and enjoy your baby. Don’t mourn the child you thought you’d have, this IS the child you are supposed to have! God created this child just for you, extra chromosome and all. So celebrate the surprise of the blessing in the extra chromosome that is uniquely a part of your child. Don’t make assumptions about what they can or can’t do, but let them show you what they are capable of. The only limits are the ones others put on them. So its simple…don’t let others limit them, but encourage them in every accomplishment. Be their biggest advocate and pray for them always. This will be the greatest adventure of your life and you’ve just landed yourself among some the most amazing families you will forever be friends with. We will clap and cheer with you and celebrate our children together. Pray out loud for your baby so your baby can hear you. It does something to your heart that is incomprehensible. Always remember to Look with your eyes, but see with your heart, because that’s the place you will really see your child for who God created them to be. Thank you so much for sharing your inspirational story! You will no doubt be an amazing hope advocate! Absolutely beautiful and so is precious Hannah! She is blessed to have you as her Mommy! You have so beautifully put into words exactly how I feel! As I was reading this, I kept thinking “yes! Me too!” Oh, and my daughter is 4 as well, Hannah Faith!! that’s was a great story. Incredible story! I could not possibly agree more on the huge blessing! Thanks for sharing! This is what i call a testimony. Praise the Lord!